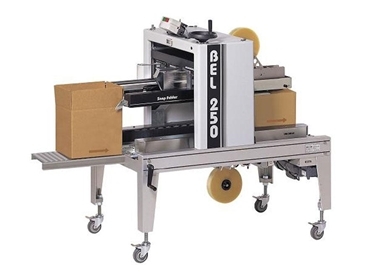 Live Industrial introduces the BEL 250 fully automatic tape sealers designed to process up to 25 cases per minute. The BEL 250 is a range of fully automatic tool-less case tapers featuring BEL’s innovative and powerful Uni-Drive system that synchronises conveyor belt speed to eliminate case skew so that cases leave the machine squarely taped. Superior tape application is enabled with the advanced DEKKA High Performance stainless steel tape heads that are easily loaded in or out of the machine in 30 seconds or less. Snap Folder flap-folding technology safeguards personnel by eliminating the traditional ‘flap kicker’, which can cause serious injury and require expensive machine guarding systems. Easy case change by the operator is enabled in the BEL 250 fully automatic tool-less case tapers with a user-friendly function that allows making box size changes from either side of the machine quickly and easily in 30 seconds or less. BEL 250 fully automatic tool-less case tapers can be integrated with the BEL 505 case former, Wexxar WF20 and WF30 case former as well as the BEL 250SS case sealer for a complete solution.